Yay, we’re resuscitating our Friday Happy Hour, highlighting a drink we’ve recently enjoyed, every Friday at 4pm! Please share your favorites as well. Is it really just a week since New Year’s Eve? Sigh. 2011 is upon us and most of DC is back at work hard. It’s cold and snow may be on the way. Does this mean no more bubbly? Hell, no! I’ve got a mania for champagne cocktails, and over at Proof you can try a very wintery combination by Adam Bernbach, poetically named Fool’s Warmth. 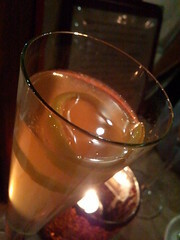 Though you might think it’s a hot toddy, both from the title and some of the ingredients – honey syrup and lemon juice – it’s actually a cold sparkler with a base of Champagne and Calvados apple brandy, plus the classic champagne cocktail component of Angostura bitters. Just the right balance of mellow sweet and tart, it was perfect on a chilly winter’s night (especially after having my system shocked by seeing Black Swan). A golden, fizzy apple love. That warms me up. All you need on a winters night is a dram of cask strength single malt scotch with a splash of water. Warm ye to the marrow.